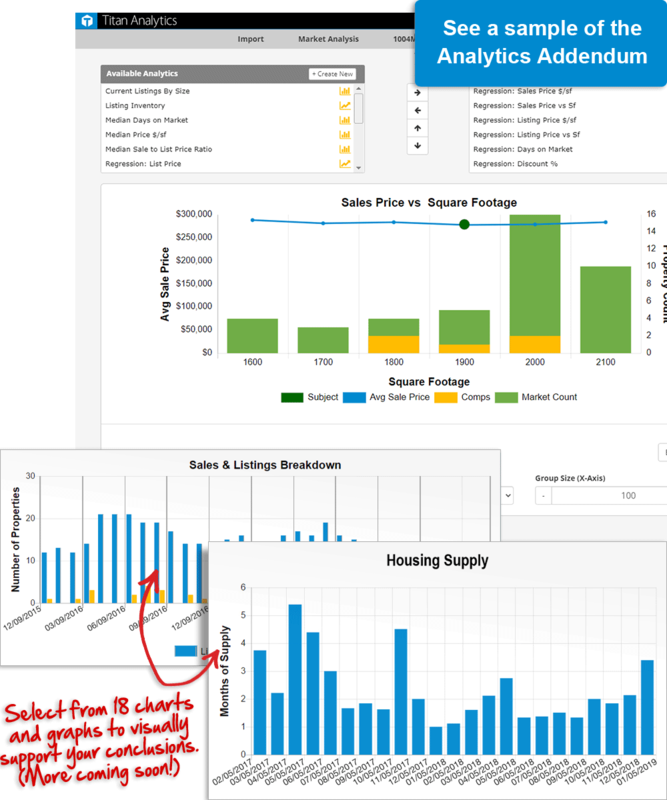 Trying to easily explain neighborhood and market trends with just commentary or a data grid leaves your report open to interpretation and clarification requests. 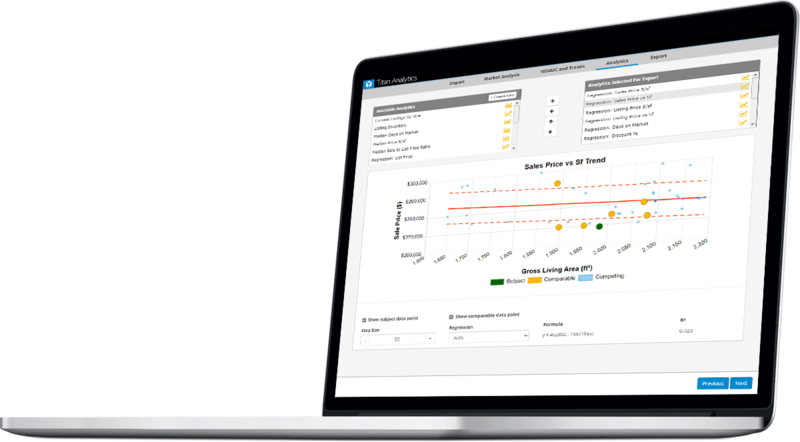 Titan Analytics not only makes it quick and easy for you to analyze market data but also provides you with visual support to back it up — making even the most in-depth analysis clear and concise. 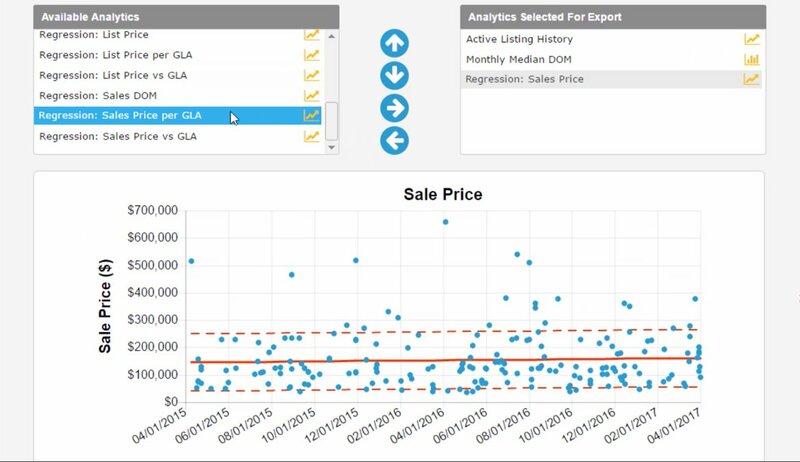 Everything you choose is placed into an Analytics Addendum in your report, describing visually to your clients the market elements that helped you reach your opinion of value. Plus, all of your data — used and unused — gets added to TOTAL's Digital Workfile (which doesn't get sent to your client) as a CSV file. 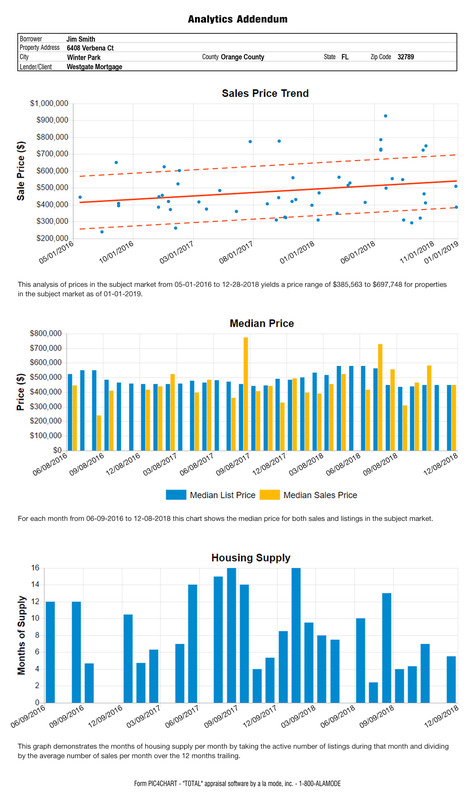 It includes the MLS data you imported and all of the relevant specifics — outliers, condos, latitude/longitude, what column it attributed to in the 1004MC grid, etc. That way, if you need to make revisions and recreate your analysis post-delivery, you can in just a few clicks. Click here to see a sample of the Analytics Addendum. 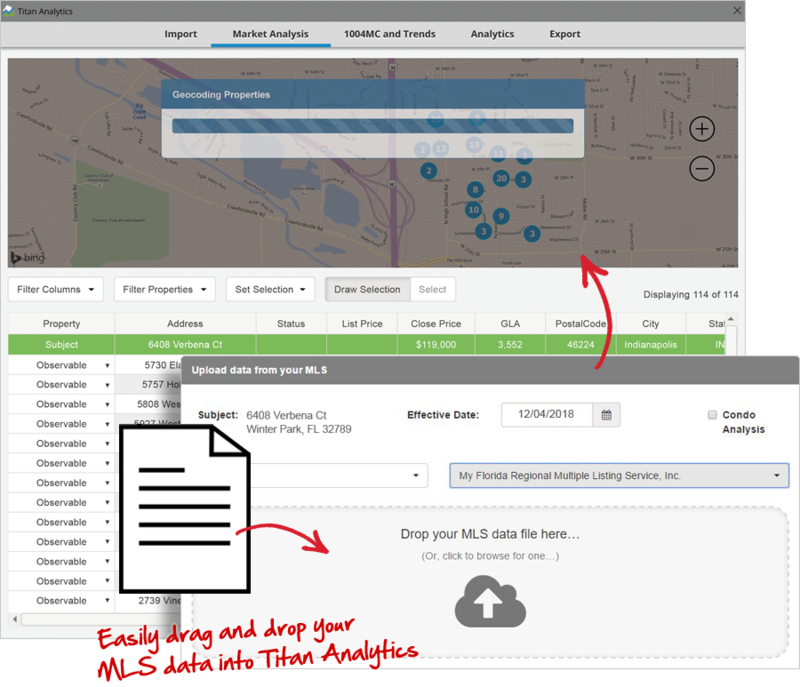 Any MLS that lets you export data (that would be all of them) works with Titan Analytics. No need to search a vendor's list of compatible MLSs or pay for custom integrations. Just export, drag and drop, watch our engine do its magic, and you're done. Sometimes properties that aren't in your market can make it into your MLS search results. 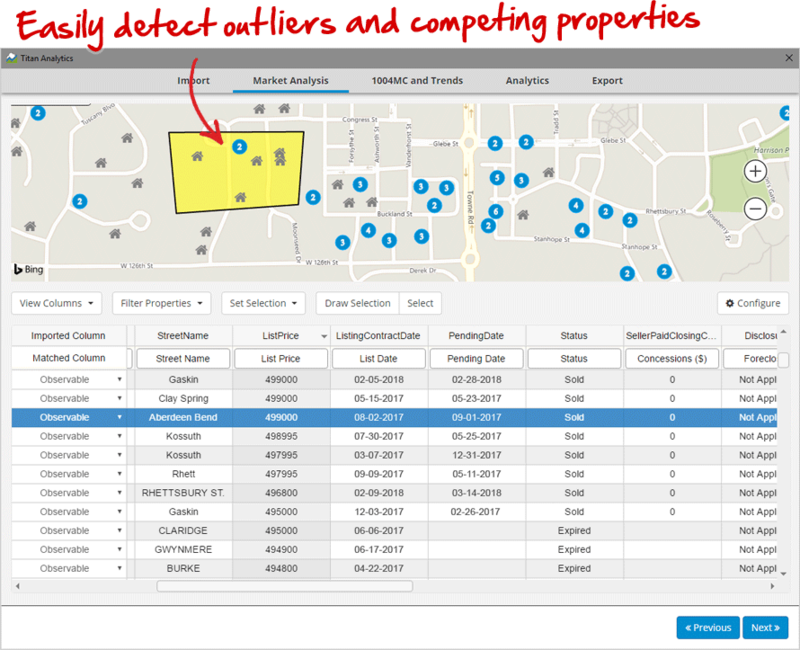 Our automatic map and data grid make it easy to spot individual properties that don't fit, based on location, lot size, GLA, status, and so on. Click, they're gone. We built this from scratch, so you'll never log in elsewhere or have to toggle back and forth with other apps. And if you have a question, you deal with our legendary support team. You're not at the mercy of a small company with minimal resources, or an appraiser you met online who gave you a spreadsheet.